Ys Origin is the first chronological Ys game and is the only entry in series where the main character is not Adol Christin. Ys Origin is an action RPG developed by Nihon Falcom for the PC and was released on December 21, 2006. The game is a prequel to Ancient Ys Vanished and is the first entry in the Ys series' timeline. Ys Origin was originally translated into English by a group of Italian hackers called Figli di Gaucci Production who released an English patch for the game on September 27, 2011. 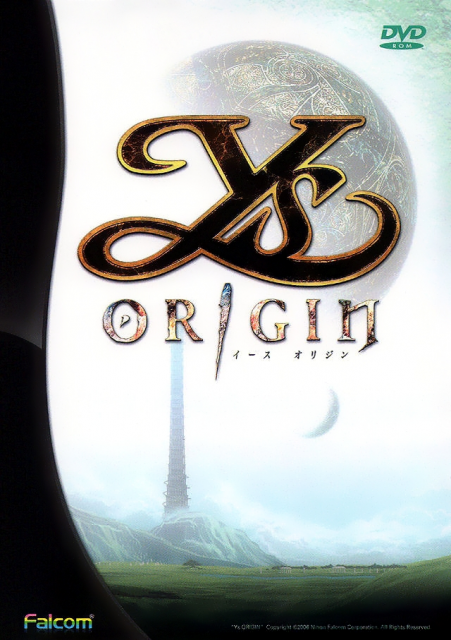 Ys Origin was released on Steam by XSEED on May 31, 2012 which used a modified version of Figli di Graucci's translation in the official release. Ys, the land that once was prosperous, ruled by the Goddesses' Reah and Feena and their loyal six priests. It was the perfect place for everyone, they can perform magic thanks to the power granted to them by the holy artifact known as the Black Pearl. One day demons and monsters invaded the land without any warning, bringing death and destruction in their wake. The numbers of the demons and monsters outnumbered the knights and sorcerers of Ys to fend off, so the people of Ys sought shelter within the holy temples at the top of the tallest mountain. In a desperate attempt to provide a safety to the people, the Goddesses used the power of the Black Pearl to raise the temple off the ground and raise it to the heavens away from the madness below. The demons were determined to bring down Ys, so they erected a very tall tower to launch further attack on Ys. With forces from Ys fighting the demons below, an all-out war has broke out. During all the chaos, the twin Goddesses disappeared into the night. No one was told of their departure and even the six priests did not know. With all the madness going on, it was clear that they have returned to the surface. Why did they go back to the surface? No one knows why. Ys is in need of the twin Goddesses or else hope is lost for the people. With the missing Goddesses, the six priests organized a search party of elite knights and sorcerers in Ys. The mission was: Secure the safety of the twin Goddesses and bring them back alive and well. Of all the places they could be in the remains of Ys, it could only be The Devil's Tower. Yunica Tovah: Yunica is a descedent of Priest Tovah. She is one of many groups that are responsible for looking into the disappearance of the two goddesses. Yunica plays pretty much like Adol Christin in almost every way except that she uses an axe instead of a sword. Hugo Fact: Hugo is a descendent of Priest Fact. He is a magician that uses magic projectiles as his weapon and he also controls floating orbs that gives him extra power for more projectiles called The Eyes of Fact. Unlike Yunica, Hugo can't attack with melee weapons but he uses magic to shoot the enemies. He is pretty much a run and gun character. The Claw: The Claw is a character that is shrouded in mystery. No one knows who or what is objective is. The Claw is also known as one of the worst kept secret character in the game.